Performing Regular Back Exercises will keep you Strong, Healthy, and Young! Back exercises are among the most important exercises you can do. When your back and spine are strong and healthy, you’re strong and healthy. When it’s not, you’re asking for trouble. 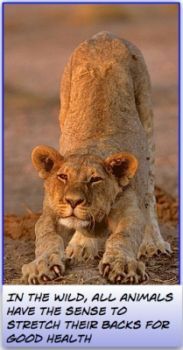 Although animals exercise their backs all the time, most people do not. Is it any surprise that more than 50% of the North American population will have back troubles at some point? Have you ever hurt your back? I have, on a couple of occasions. When your back is painful, the simplest tasks become difficult. It’s incredibly awkward to stand up from a chair. A task as simple as walking becomes difficult. You can’t do ANYTHING! A back injury is unlike anything else. If you pull a muscle in your arm or leg, you can still get around. With a back injury, you immediately turn into a 90-year-old man or woman. To some extent, it’s not our fault. Like all four legged animals, our backs evolved to carry an even load across the entire spine. However, when we started to walk upright, our backs paid the price. Instead of balancing the weight of the body evenly, walking upright turns our spines into flagpoles. What’s worse, these flagpoles must support an enormous weight (our heads) right on top. Modern Man (and woman!) then compounds this design flaw by adding poor posture, obesity, and inactivity into the mix. 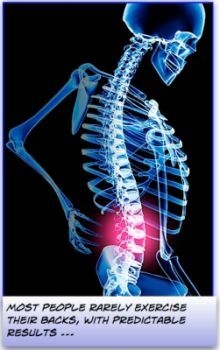 If you want to avoid back pain (and who doesn’t? ), you should be performing back exercises on a regular basis. Two of the exercises presented here, the Cobra and the Bridge, involve bending your back backwards. Most people find this awkward at first, as it is not a movement they regularly do. However, proper back bending is one of the best things you can do for you back (so long as you back is not injured to begin with). Our backs, like our entire bodies, are meant to move animal like in all angles and directions. Most people, however, slouch in their chairs at work and have poor posture the rest of the time. Bending your back backwards will stretch your spine and release a lot of the tension that you unknowingly built up during the day. The Cobra is a basic yoga posture that anyone can do. It provides a blood rush to the spine, the sympathetic nerves and cells, and all the muscles of the back. It also helps the spine gain the elasticity so essential to a vigorous, healthy body. This exercise will increase the strength in the upper and lower spine, while at the same time promoting flexibility. This is one of the best bodyweight exercises you can do. Not only does it work your back (it involves back bending, similar to the cobra) but it strengthens your chest, shoulders, and arms as well. This is the eBook I created that can get you in shape in no time flat. It also contains the single best exercise you can do to strengthen and heal your back, not to mention your entire body. This item is now available from Amazon.com as well. To check it out select it from the Amazon widget above or click HERE. If you liked the cobra exercise, then you should love the exercises in this book. All are in some way inspired by animal movement. Not only can they be done quickly, but they are incredibly effective as well. This item is now available from Amazon.com as well. To check it out select it from the Amazon widget above or click HERE. Isometrics are an incredibly effective form of natural exercise that can be done by anyone anywhere. My Power Isometrics course also contains many fantastic exercises for strengthening the back. This program, both in book and DVD format is now available from Amazon.com. You can take a look by selecting the widget above or by clicking HERE (for the book) or HERE (for the DVD). If you found this exercise to be helpful, help me spread the word by using these cool social networks buttons below. Thanks!